OCC is offering you to read this article of the Rev. Fr. Joseph Huneycutt. In this Section of the OCC dedicated to considerations about Orthodox Unity, we thought that, many of the points Fr. Joseph rises, would be of interest to our readers, specially to those who belong to that Orthodoxy that spring from nationalism and fix linguistic attachments. Fr. Joseph confesses he had to learn much since the moment he approached Orthodoxy. However he, like most of us who have found life in Holy Orthodoxy, also have concluded that Orthodoxy, in its plethora of jurisdictions, will have to learn some things, appreciate some things of the culture of the new lands where is now spreading before being truly successful in bringing those lands to the Orthodox Faith. As he says, most of us, the Converts to Orthodoxy, have stumbled upon the Faith only after many years of searching. Then the smorgasbord of Orthodox jurisdictions makes absolutely no sense to most Converts, or make them schizophrenized, like becoming more Russian than the Russians or more Greek than the Greeks, making them to forget to be Christians. Fr Joseph (David) Huneycutt was reared a Southern Baptist in North Carolina. He served as Curate of St Mary’s Episcopal Church, Asheville, prior to converting to Holy Orthodoxy in 1993. Fr Joseph received a Doctor of Ministry in the Eastern Christian Context from Pittsburgh Theological Seminary in conjunction with the Antiochian House of Studies in 1999. In addition to developing and leading Orthodox retreats and conferences, Fr Joseph has helped to establish seven Orthodox Missions in the South, USA. Father Joseph Huneycutt is pastor of St Raphael Orthodox Church in Hendersonville, NC. I'm a Southerner. I was born and reared a Southern Baptist; educated as an Episcopalian, and converted to Orthodox Christianity a decade ago. Since then, I've been struggling to be Orthodox. As a missionary priest, I've also struggled to bring others to Orthodoxy in the South. More than anything, I've learned that I have a lot to learn. I've also concluded that Orthodoxy, in its plethora of jurisdictions, will have to learn some things, appreciate some things, about Southern Culture before ever being truly successful in bringing Southerners to the Faith. I was reared in a small town near Charlotte, North Carolina. Growing up, I never met a Jew, much less a Muslim. Lutherans were rare enough in my hometown, much less Roman Catholics. Basically, we were Baptists and Methodists, blacks and whites. I'd never even heard of Orthodox Christianity until I was on my way to the Episcopal seminary in the 1980's. Come to think of it, I'll bet most folks in my hometown still have never heard of Orthodoxy. I have heard that the seminaries in Russia are bursting with future priests. We have a priest shortage in America, they may soon have a glut in Russia. It wouldn't surprise me if they sent some of those men to this country to evangelize. That would certainly wake us from our jurisdictional squabbling and anti-Christian stupor! Maybe our constant judging and nitpicking would be tempered by some honest to goodness evangelism? We Southerners have many weaknesses. Paramount is our ingratiating spirit. We deliberately set out to gain others' favour by winsome actions. Hopelessly people-pleasing we are! Being "cut from this cloth," we also have a weakness for taking a man at his word. If you tell us that you're going to do something, more often than not, we expect you'll do it. If you don't, there's a good chance that you'll lose our trust, permanently. This behaviour will differ between Southerners and Southerners and Southerners and Outsiders. Like any ethnic group, we trust our own a while longer. Yet, to a Southerner, duplicity appears rampant in American Orthodoxy. Arabs, Russians, and other cultures are accustomed to hubris and other blustering within daily discourse. In the South, we expect it of politicians. We discourage it in decent folks. Integrity, in the South, is expected of church leaders. Having found the True Faith we're confused by contradictory words and actions which often emanate from the various jurisdictional hierarchs. When I first became Orthodox in the Antiochian jurisdiction, someone suggested that I read a book entitled "The Arab Mind" to get a sense of my newly adopted church culture. The book claimed that, in Arabic, the root word for eloquence and exaggeration is the same. An Arab may exaggerate to show machismo. For instance, a man may shout across a street corner to another "I hate you." The other man replies, "I not only hate you, I'm going to kill you!" The man retorts "I'm going to kill you and your family!" Etc. These same men may later be found sharing a friendly meal together. Words fail me in describing how this same dialogue might have ended in the South. Put it this way, funeral processions still stall traffic in these parts. Contrary to outsiders' perceptions, Southerners do not put on airs. Though we may be hospitable, friendly, and civil, what you see is what you get. If we share openly with you, it means we trust you. Once you break that trust, it may be irreparable. All are welcomed here. Yet, we are easily offended. If offended, the offending party will be cut off till reparation. Our people-pleasing nature lends itself to over-sensitivity. It just comes with the territory. In the South, admiration comes easy, respect is earned over time. Like all those outside Paradise, Southerners gossip. In a region where being idle is considered a virtue, idle talk ain't far behind! I don't mean the kind of vindictive gossip popularized by Soap Operas and other media. (Though we have that too.) Rather, Southerners carry on conversations in a way that others might view as gossiping. And, God help us, at times it is. Yet, often this is a manner of couching subjects within an engaging tale. It's the way we talk around here. Southerners are self-effacing. We can take criticism if it's properly couched in civility and/or humour. For us, if direct confrontation is necessary, things have already gone too far! Sometimes our neighbors to the North skip all the niceties and cut right to the chase. (Northern aggression continues.) And, since all the Orthodox jurisdictions hail from a different culture with the "home offices" up North, this element of cultural war persists within church dynamics. Brutal honesty is not only unwelcome but most often rejected in the South. Before attending my first gathering of Clergy and Church Wardens in the Russian Church, I was asked about the nature and agenda of the meeting. I said, "Well, they'll probably argue and yell at each other for a few hours and then we'll have lunch. After lunch, they'll argue and yell some more then we'll kiss each other goodbye and go home." I'm no prophet, but boy was I ever on the mark with that prediction! In such a setting you can recognize the Southerner -- he's the one with his mouth shut. If asked, were he honest, he'd say "I think you all are crazy." But, "don't ask, don't tell" has always been policy where I'm from. Being slightly dishonest in the name of civility is considered a virtue. You yell at a Southerner and it may have eternal consequences. When we speak, all that's required of you is to listen politely until it's your turn. We don't take kindly yelling, interruption, jeering, or public ridicule. We may not break bread with you until there's resolution. You don't have to agree, mind you. But, you must behave in such a way that assures civil discussion and debate. It may be that we take things personally. But, we operate on the assumption that you do to. Therefore, quite selfishly, the Golden Rule applies no matter what your rank or station. Northerners are most often defined by their family's nation of origin. This type of identification is foreign to the South. Here, folks are identified by their family name and/or their religious affiliation. I've often heard Northerners speak of someone as being Italian, Ukrainian, German, etc. Along with this description is the implied religion of those being described (Roman Catholic, Orthodox, Lutheran, etc). This is not the case in the South. Here, folks are defined by their religion: Baptist, Episcopalian, Methodist, Charismatic. So it is that Northern Orthodox are often amazed that Christians would intentionally convert to Eastern Orthodoxy. What an idea! Can you convert from Italian to German? Folks in the rural South usually attend the church nearest their home. In the country, you'll find mostly Baptists, Methodists, and Pentecostals. Towns will have Presbyterian and Episcopalian churches. And, here and there, you'll find Lutheran pockets and an occasional Roman Catholic church. Latins and Lutherans may have a bit of a drive or live within a "family burb." However, Presbyterian and especially Episcopalian churches are populated with many who have "worked their way up" to that denomination. Your particular brand of Christianity may be a status symbol in the South. Unfortunately, viewed from such binoculars, Orthodoxy can seem a step down. Forgive me, but to a proper Episcopalian, Orthodoxy can seem down right barbaric! When expected, don't be surprised if a Southerner shows up early and leaves late. We don't understand "Orthodox People Time." If you tell a Southerner that something starts at 6:00 pm, he'll most likely arrive at 5:45. We don't want to miss a thing! We're not only unaccustomed to the Orthodox habit of being late, we find it rude and uncivilized. Also, Southerners usually don't leave without saying Goodbye, many times. This process of departing may take 30 minutes or better. Southern culture is, at least, as relevant as other forms of ethnicity -- whether "Orthodox" or not. We Converts appreciate the foods and festivities of our adopted culture. But, must we discard our norms and ways and replace them with those of traditionally Orthodox lands? Fund raising's fine, but what about tithing? Lamb's good, but so is pork barbecue. Pascha and kollich is festive, but that first bite of pecan pie is just as heavenly. Can such Southern gatherings as Mother's Day, Thanksgiving, family reunions, BBQs, and oyster roasts be "baptized" into Orthodoxy? It's too early to tell. Orthodoxy is new to the South. And it's yet to be seen whether the two can melt into one God-pleasing flavor. Converts have lots of extended family and friends that remain Protestant. Thus, most find themselves in awkward situations. Wednesdays and Fridays may not be as difficult to negotiate as is the Peter & Paul Fast or fasting for Easter and Christmas. I baptized a man who, for years, had hosted the family pig-picking on July 4th. Of course, that's often a fast day. But that was his one big family obligation. I remember a couple that I'd chrismated and had moved away. The next major fast to come along, I called to see how they were doing. They, in jest I suppose, replied "Oh, we're doing fine. We're just eating over at our [non-Orthodox] friends' each evening!" The pendulum may swing otherwise. You've seen them: the "Orthodox Taliban." The man grows long hair and beard, forgets how to smile. The woman covers herself from head to toe -- her modesty smothers her dignity. They both stop bathing. There's no visible joy in their life. Their wrists are covered with wool knots. They eat only broccoli; tofu is reserved for feast days. They begin shopping for a home -- preferably a tent or a lean-to -- out in the woods, sans the burden of electricity. These things may not be harmful in and of themselves. Yet oftentimes, when Converts confuse such "asceticism" with Orthodoxy, it can have dire results. 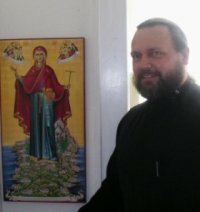 So, what's a Southern Orthodox Convert to do? Assimilation with the Protestant milieu is not an option. Been there, was that. Christianity plus icons and Typicon is not the answer. Why bother? Becoming a dirt-eating-tree-hugging Druid is not the way. I mean, really. Then again, these options are all alive and "well" within the Church. And that may be okay, as far as God's concerned, but it comes close to grits without salt for a Southerner. Thanks to the War Between the States and Reconstruction, Southerners have a strong distrust of outside authority. As the saying goes, "Fool me once, shame on you; fool me twice, shame on me." There's an underdog thread that binds us together. Yet when asked to perform a task by those in authority, one can bet it shall be done. We are teachable. However, all things must be in accord with proper respect. Our experience teaches that there's virtue in losing when done graciously. Nevertheless, we have strong suspicions regarding authority. Those in positions of Orthodox leadership would do well to familiarize themselves with the norms of Southern behaviour and expectations. After all, if you are serious about evangelizing another land, which the South definitely is, you would do no less! OCC presentation of this page, 12 August 2004.